Monday, January 23, 2012: Shortly before noon, we piled into the Family Truckster, bid adieu to our gracious host and once again hit the road. Fortunately, there was no damage. Duh…..I didn’t notice that road was there yesterday. Decided to take a more northerly route across Texas this year. 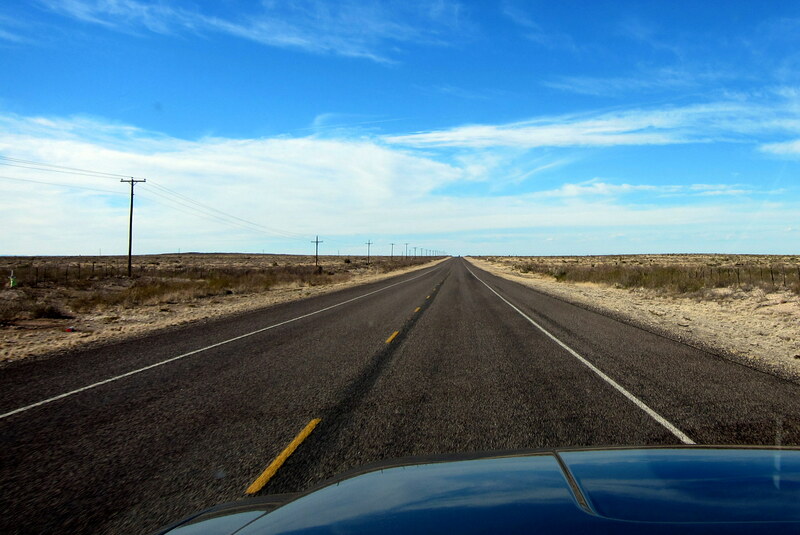 In trips past we have driven US-90 through many small towns or headed further south to the gulf coast and followed the border route through Del Rio and Big Bend National Park. Not finding a suitable back road we reluctantly jumped on I-35 heading north. 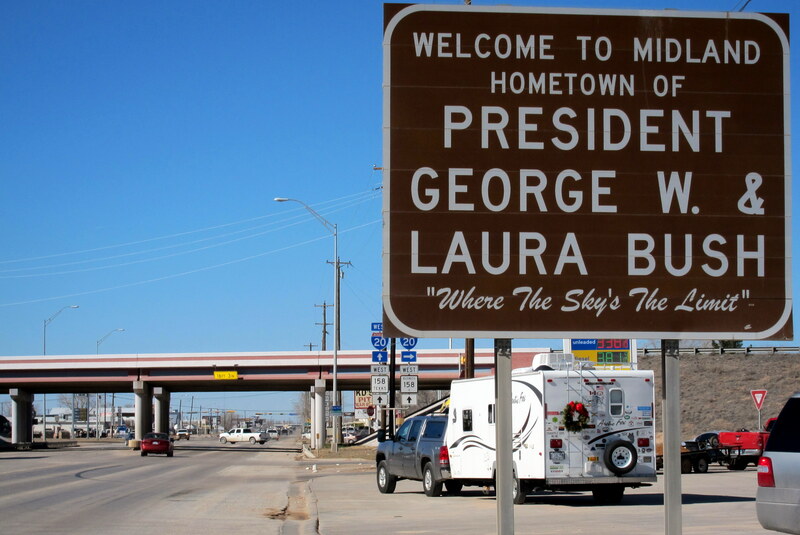 Once past Austin we moved over to US-195 and made our way to Killeen, Texas the home of Fort Hood Army Base. 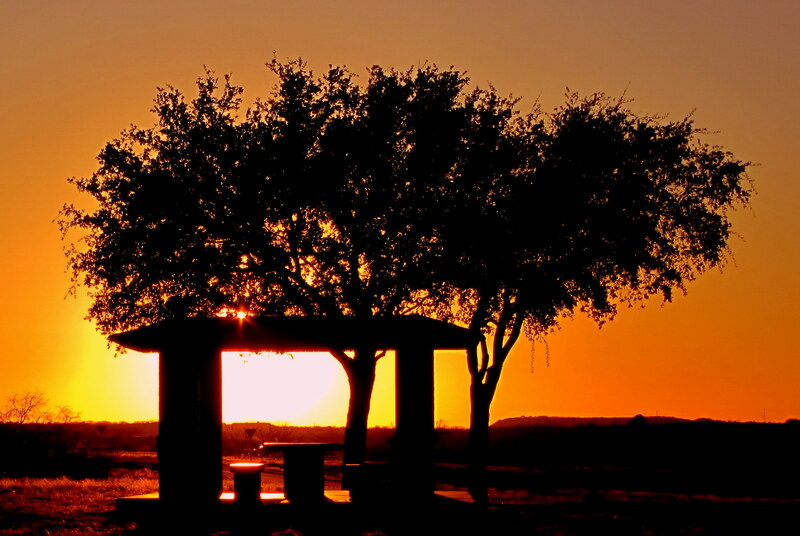 We decided to stay a night or two at the military campground on Fort Hood in order to dump tanks, take care of laundry, replenish at the commissary and tour one of the largest military installations in the world. There was plenty of room at the park so we choose a nice site off by ourselves. Getting on the base is a challenge, especially pulling an RV. First there is an intensive screening process and inspection of the trailer, and then virtually everywhere you go you’re asked to show your military ID card. This heightened security starts to make sense when you learn that Fort Hood is a prime target to those who want to strike out at the US Military. In addition, two years ago, on this very post, a US Army Major turned radical Islamic Terrorist gunned down 43 individuals, killing 13 of them. Tuesday, January 24, 2012-Fort Hood, Texas: This place is huge! At 250,000 acres and 33,700 personnel, Fort Hood is the largest military installation in the United States. In driving around the post, you have a feeling you’re in any small town, USA. However with so many of the residents wearing military camouflage the place looks deserted. We took care of some chores, stocked up and stayed in for the afternoon. There was a big storm brewing and we needed to take care of some correspondence and internet banking. Water Rescues, Flash Floods Hit Texas: Inches of rain have fallen overnight, creating a dangerous situation. Stay off the roads until water recedes and be alert for flash flooding. So we debated whether to stay another night or wait until midmorning to see if the flooding had lessened. By 1000 we determined it was safe to travel so we broke camp and got on the road by 1050. Choosing to take US-190 heading west toward Rochelle, Texas we soon witnessed this rather ominous sight out the windshield. 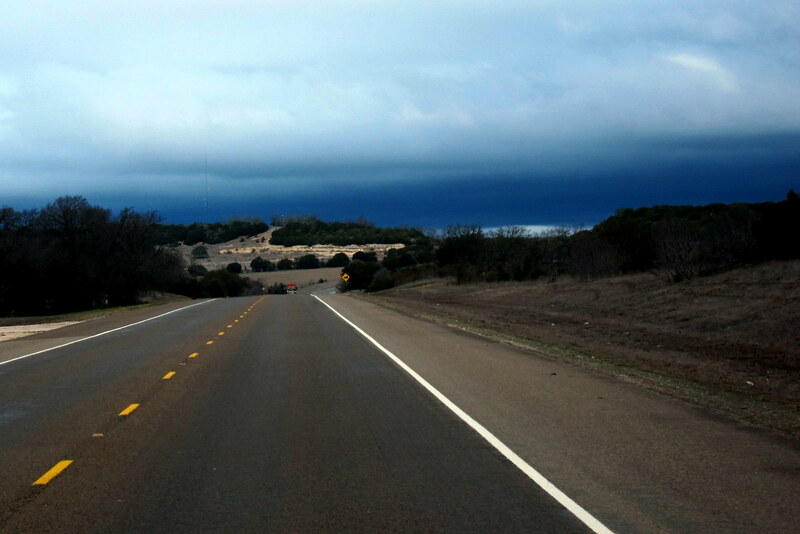 However the only weather we encountered was some light drizzle as the storm passed to the north of our track. In a few hours we moved over to US-1121 and continued west. Traffic was light on this two lane country road and the driving was easy. Avoiding the Interstates causes us, at times, to stitch together a number of local roads to head in our intended direction. 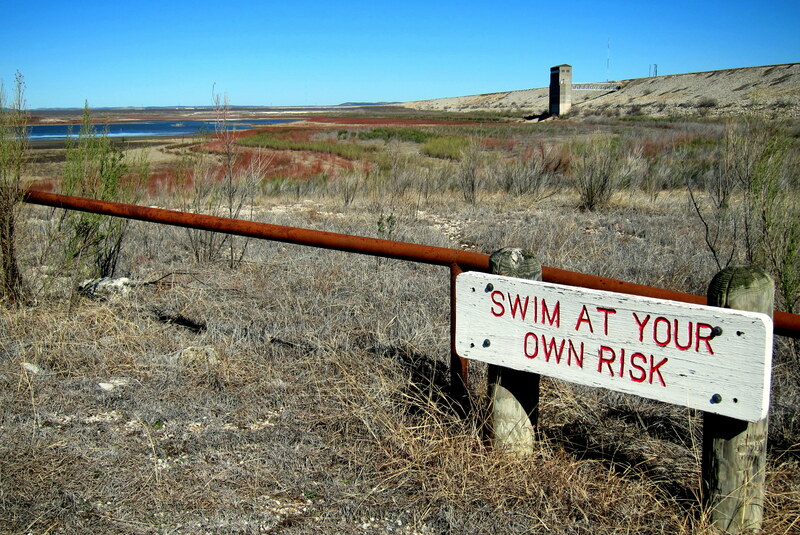 Such was the case today as we pinballed about central Texas until eventually riding US-87N into San Angelo. Since it was approaching 1600, we decided to stay for the night at San Angelo State Park where we chose a nice secluded camp site. Thursday, January 26, 2012-San Angelo State Park, Texas: Since we had electric and water hookups we decided to stay a second night so we could look around the park a bit. Around 0900 we took off in the truck to explore this 7500 acre facility. 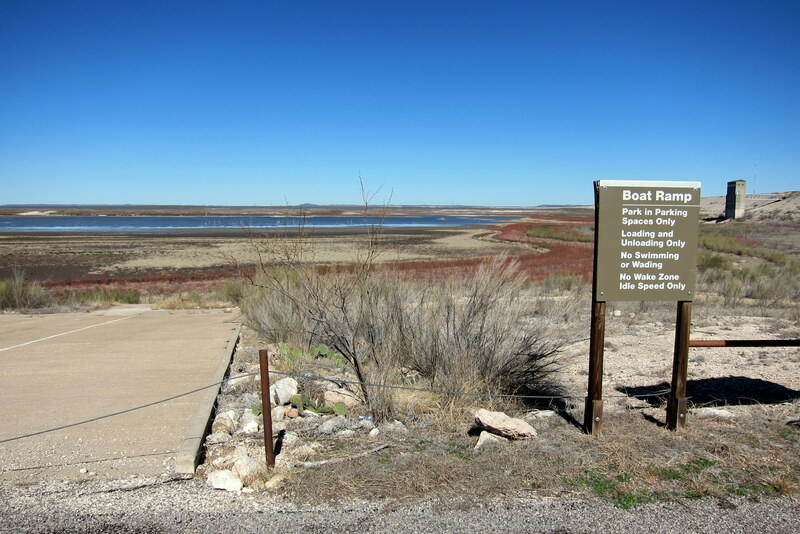 San Angelo State Park normally sits on the shore of OC Fisher Lake, however due to the severe drought it is has been reduced to a large pond. The boat launch ramp is high and dry and hundreds of yards from the water. And swimming could be a bit thorny (pun intended). There were some very nice hiking and biking trails that crisscross the park. Kit went for a walk and had an enjoyable time…..however she did have a rather close encounter with a skunk that left her a bit rattled. 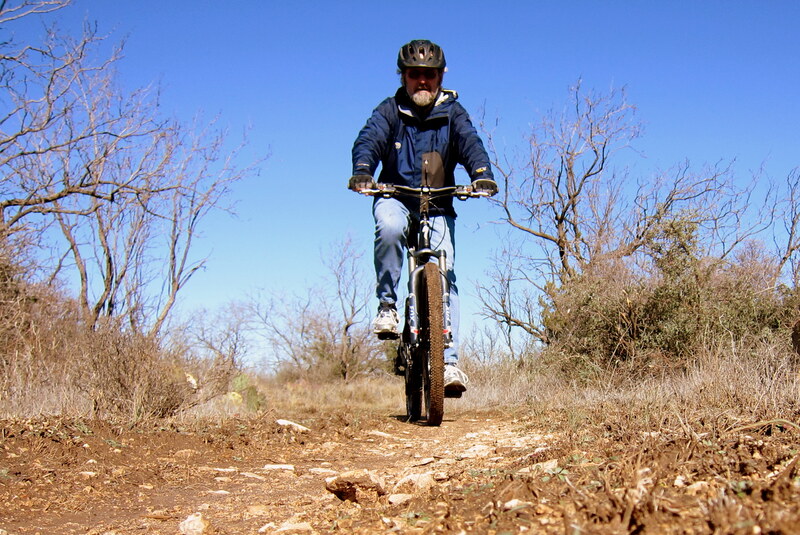 I took off on my bike to explore some of the backcountry trails. 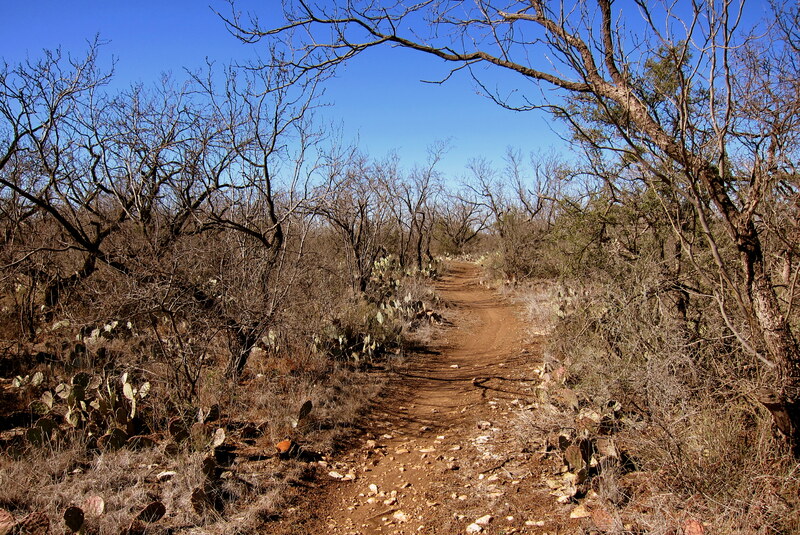 Most of the bike trails were flat single-track with the usual desert obstacles about. While riding past a damp portion of the trail I noticed the below paw prints. Actually, I guess they could have been maw prints, not knowing the gender of the animal. Don’t even know what kind of animal it might have been. 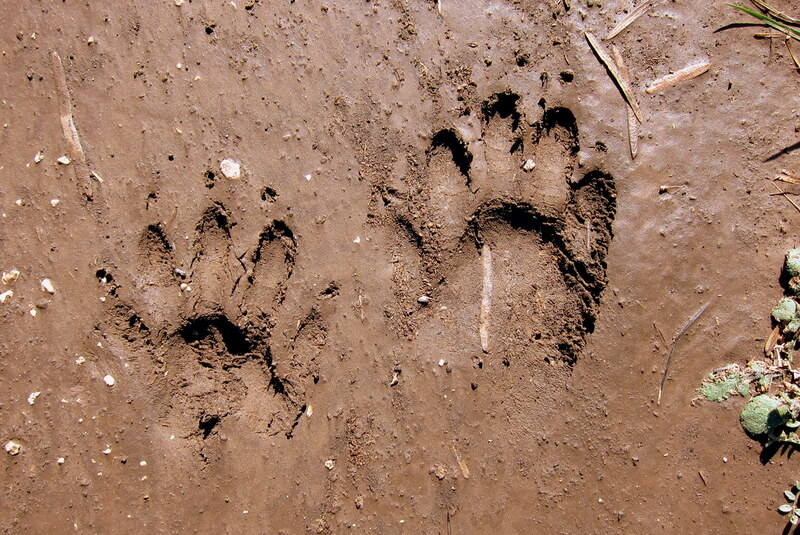 Any of you wildlife experts care to identify what made these impressions? Not being sure exactly where on the food chain I might be, I picked up the pace a bit. Back at camp, and with me still out, Kit was able to enjoy some quite reading time and work on a knitting project. I think she scored a nap as well. Later in the afternoon, due to a nice steady breeze, I was able to do some more kite flying. If only the lake was a bit more accessible I could have enjoyed the illusive “Triple Crown”, biking, flying and kayaking in the same day…..oh well maybe next time. After a very enjoyable and relaxing day we sat out, enjoyed cocktails and watched the sun set in the western sky. 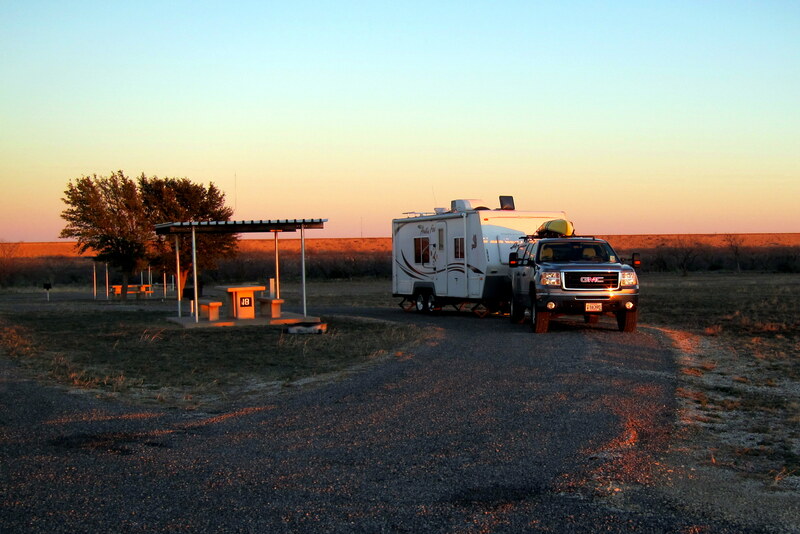 Friday, January 27, 2012: A beautiful, clear cool morning dawned as we made preparations to leave San Angelo State Park. At a little before 1000, following a stop at the dump station, we were back on US-87N and setting a course toward Midland, Texas. As the terrain changed from rolling hills to the plains of west Texas we started seeing more and more oil wells. Nothing unusual about this, except most of them were actively pumping and there was even evidence of new drilling. We also started noticing the distinct aroma of raw crude oil emanating from the many new tank farms along the highway. In addition over 50 percent of the traffic on this highway was tanker trucks or oil field service trucks. Now, this part of US-87 has a posted speed limit of 75 MPH. That’s a closing speed of 150 MPH, folks…..on a narrow two lane road…..Yikes! We, of course, were trundling along at our customary 55 to 60 MPH so we generally were leading a parade of anxious truck drivers until it was safe to pull over and let them by. Most of those professional truckers were appreciative and either honked, waved or flashed their lights in thanks. One or two even indicated I was number one by use of hand gestures. Stopped midday at a roadside picnic area that contained what we have been calling Texas Targets. Those are any signs, most containing historical or other information that stand there just waiting to be shot at. 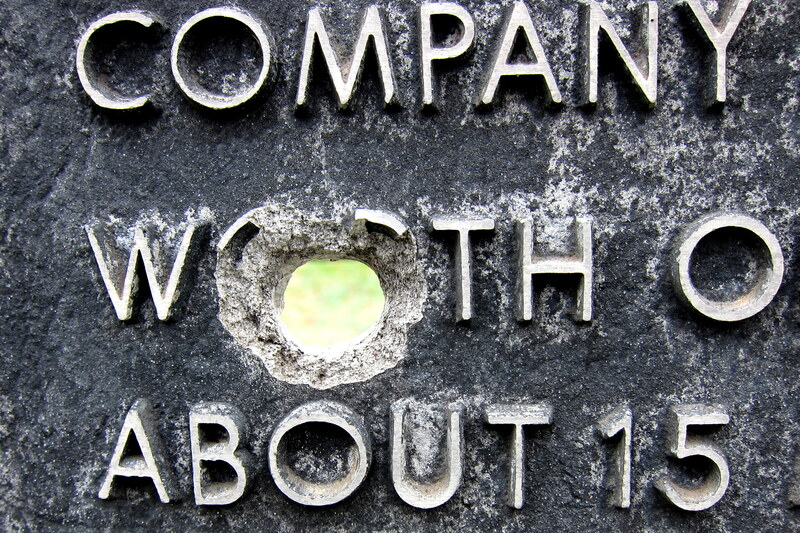 Big bullet hole…..perhaps my hunter friends can decipher the caliber of the round that made that ¾ inch hole. Occasionally, a true marksman will group a few rounds close enough to serve as a frame of sorts for our sitting rig. Shortly after noon we punched out the backside of the drizzly weather and pulled into Midland, Texas where we noticed this sign. I think the motto; “Where The Sky’s The Limit” refers to the Federal Budget. Feeling a patriotic duty to see the abode that shaped young Georges formative years we hunted around for the old homestead. Soon, on a quiet street, a few blocks from downtown, we found it! A rather unimposing home that at one time, housed two future presidents, two future governors and a future first lady. In later years it housed common folk that actually worked for a living. If you look closely at the top of the chimney, you should notice an inverted cross…..I’m thinking that’s a satanic symbol, every bit as insidious as the Subaru logo. Also you will notice something unusual about the landscaping…..the yard is full of perennials known as “Dubya Bush’s”. Notice how all their limbs and branches emanate from the right side of the stem. We also learned that Midland is home to the Commemorative (formerly Confederate) Air Force. This collection of WWII military war-birds was started by some friends acquiring a surplus P-51 Mustang back in 1957. Soon they attracted partners and acquired more vintage planes so that today there are 9,000 members and a collection of 160 aircraft. We seriously considered a RON (military jargon that means-Remain Over Night), but the docent at Bush’s place said that all area campgrounds were chock full due to the new Texas oil boom……so visiting The Commemorative Air Force will go on the Bucket List for another time. Texas oil boom????? Yep…..West Texas is once again rolling in oil money due to modern technology being used to extract additional oil from what was once thought to be depleted fields. The use of Hydraulic Fracturing (also called Fracking) to open up solid rock allows wells to access these vast oil resources. In addition it has opened a huge environmental controversy. But not in Midland…..they love it! Leaving the town of Midland we traveled west on TX-257 then moved over to TX-302 continuing west. Soon we were passing the small town of Notrees, Texas (yep, true to its handle…..there were no trees) and Kermit, Texas. The later advertised as the home of Jim Sharp…..nothing particularly important about that except old Jim was the only resident. This part of Texas is miles and miles of miles and miles. We started noticing facilities that were built for the purpose of turning brine into fresh water. We have seen these desalination plants before, but usually near the seacoast. In this case these salt to fresh water plants take the waste byproduct from Hydraulic Fracturing, which is estimated to be 170 million gallons a month and turn it into fresh water by a process called reverse osmosis. The US Navy uses a similar method to turn seawater into potable water for shipboard use. Texas A&M is leading the research in this effort. 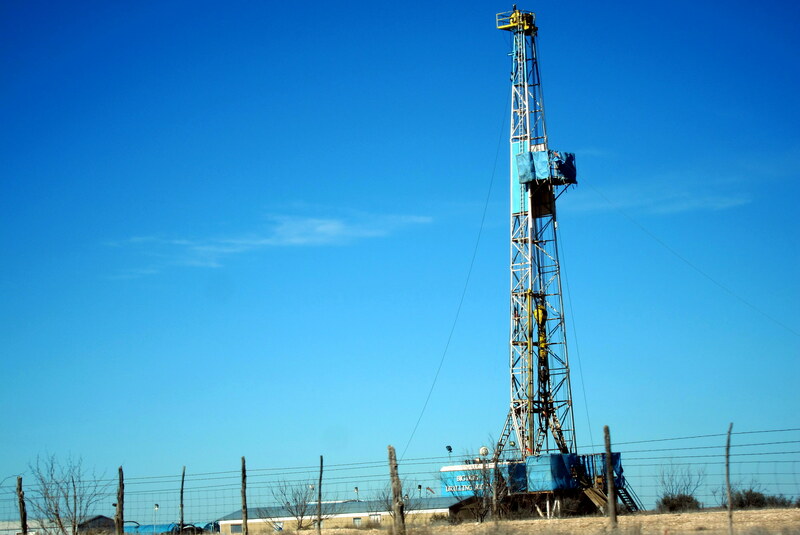 Regardless of one’s political opinion of the Fracturing process, turning a pollutant into a resource makes sense…..especially in drought stricken Texas. Soon we moved over to US-285N and at 1645 we crossed into New Mexico and the Mountain Time Zone. Almost instantly the terrain changed…..what had been flat barren plains turned into rolling hills with more green vegetation. 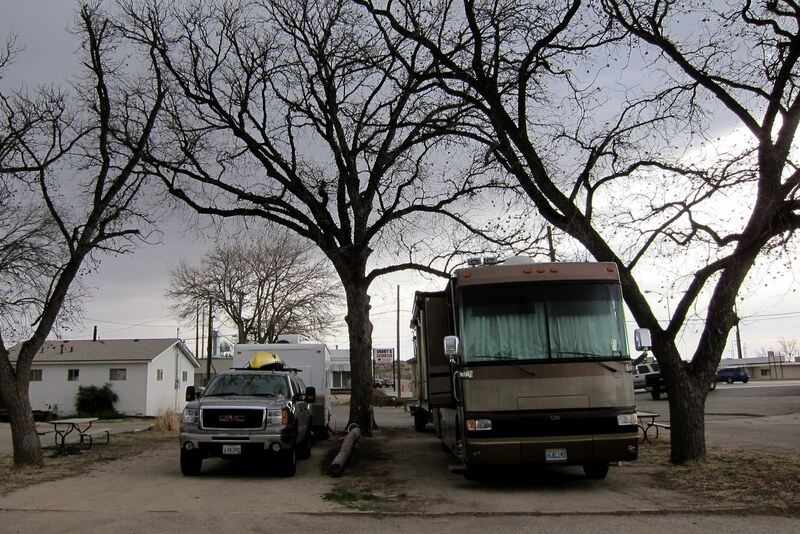 At 1627 we pulled into Carlsbad, NM and the Pecos River RV Park (Yep, 1627…..we gained an hour back at time 1645). 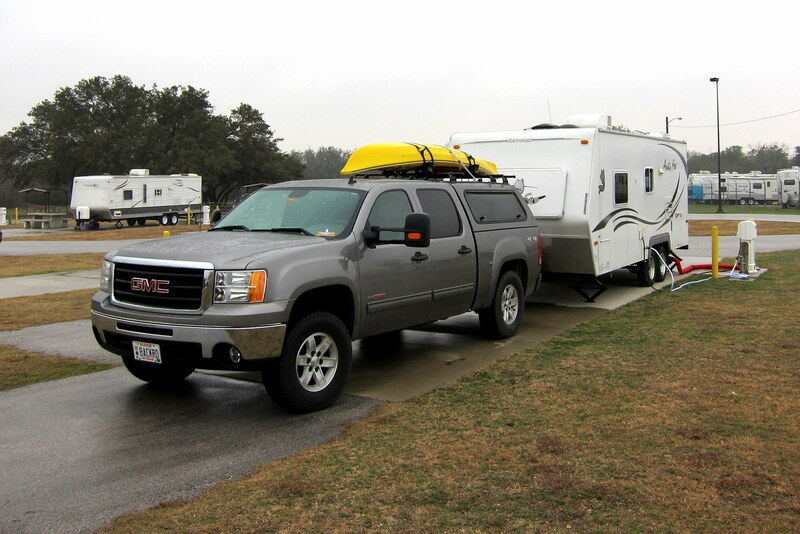 The RV Park was in town and not the type of place we like to camp, especially when a big bully pulls in right beside us…..but it was cheap and convenient. Those large trees you see in the photo above are Pecan Trees and their nuts! Dropping golf ball sized Pecan pods all over the place. While out taking photo’s the RV Park owner came over and explained that the pecan is actually a fruit and grows inside its shell which is encased in a husk. When the fruit ripens the husk splits into four segments and releases the shell. 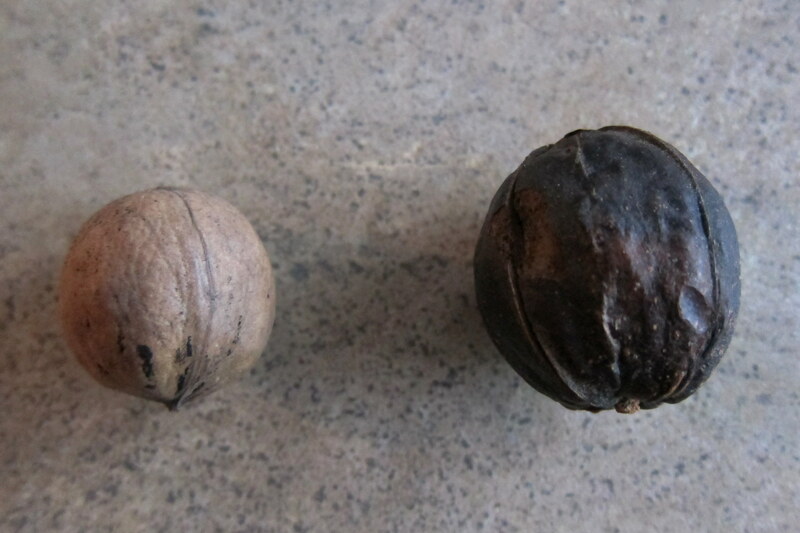 Below is a photo of the husk on the right and the pecan in its shell on the left. Commercial Pecan growers use devices called Shakers that grab the trunk and, well shake the beejeses out of it. The Pecan shells then fall out of their husk landing on the ground where they are collected. In the case of these trees, they just let the Pecan’s fall naturally or leave them for the squirrels and birds. She invited me to pick up as many Pecans as I wanted. I then spent a bit of time trying to get at the fruit inside…..a task well worth the effort. Oh, she also said Pecan is an Indian word meaning “a nut requiring a stone to crack”……Google it! 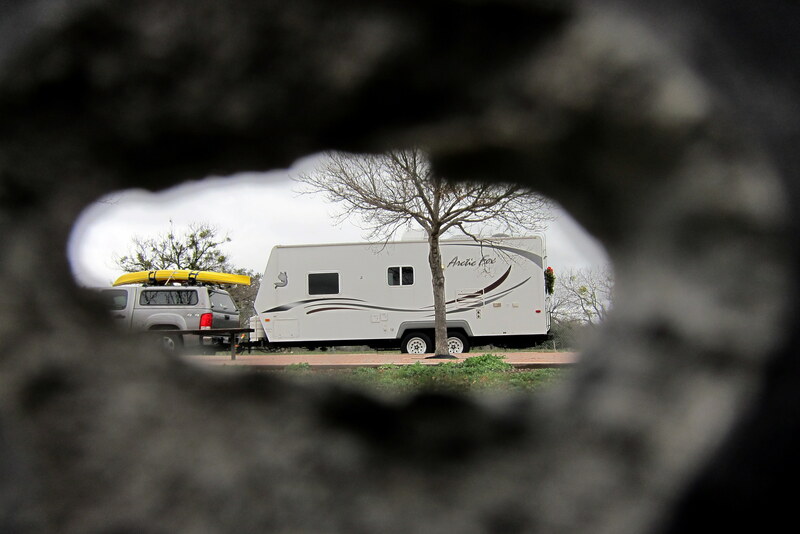 True to its name, this RV Park backs up onto the Pecos River which runs right through the town of Carlsbad. 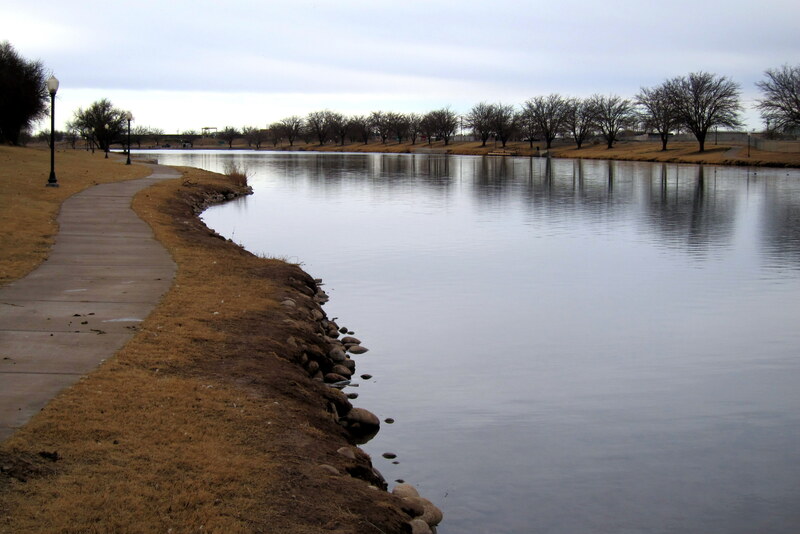 It features a very nice river walk and lots of local water fowl. 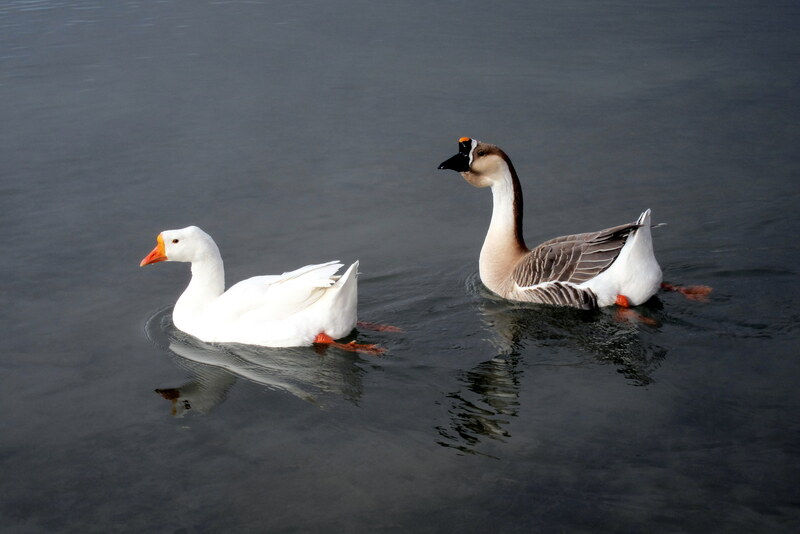 I think these are geese, but they don’t look like any goose I’ve seen back home. Not that I notice a goose, at least at first…..it kinda comes as unexpected surprise……like an Atomic Wedgie…..um, or so I’ve been told. Back at the trailer we booted up the computer and learned that today is the 125th anniversary of the discovery of the world’s largest snowflake. I guess the 15 inch specimen was shipped to England where the folks at the Guinness tasting room studied the spot of water and certified the claim. Reminds you of every party you have ever been to, doesn’t it? 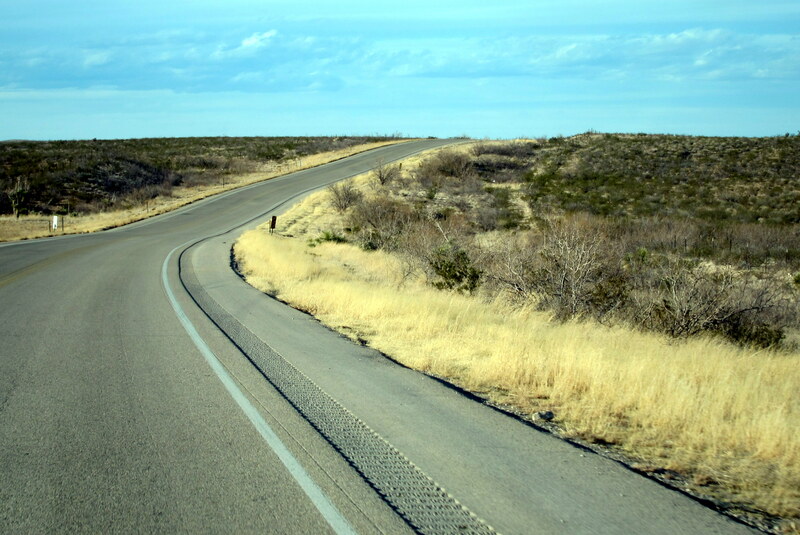 Kit’s Corner: Texas is so big; I doubt we will run out of roads to take to get through it. Years ago, we drove faster and mostly at night to get through it but, of course, we always had time constraints. Now, taking our time, we can finally explore and enjoy the many nice places in the state, especially their beautiful State Parks. We try to stay in a couple of new ones each time we pass through. We are looking forward to a bit more time in New Mexico. We usually just cut across the southwest corner on our way to AZ. did you meet Yosemite Sam, the baddest hombre west of the Pecos. Hi Bunny, what a thrill hearing from you……how is rehab going? Good job on the narration! Bullet hole was .270 caliber, recognize it by the way the “letter O” was disfigured by 3/4″. Tom agrees those footprints were made by a misplaced mountain lion, we’re sending to Walt for expert confirmation. You guys are looking great, upset we didn’t get together this summer. Upon your return, we promise. (We being Vicky and I, don’t want you to think Hobbit we) Keep the good pictures coming, really enjoy reading your postings. So much more interesting than seeing you every day!! Ha, ha….. Thanks for the ID…..there was a sign as you enter the park about Cougar’s being about, so that was probably what made the prints. Look forward to seeing you guys this spring…..someone owes someone some lobster! I am so enjoying these pictures! The video was cool too! Thanks for the nice comment and for following along on this years trip. Hi folks! You are getting closer to BLM LTVA Imperial Dam all the time! thoroughly enjoyed traveling along with you in Texas…had me laughing a lot, and yeah, I needed that. Oh, better watch your tires on the trailer for wear. 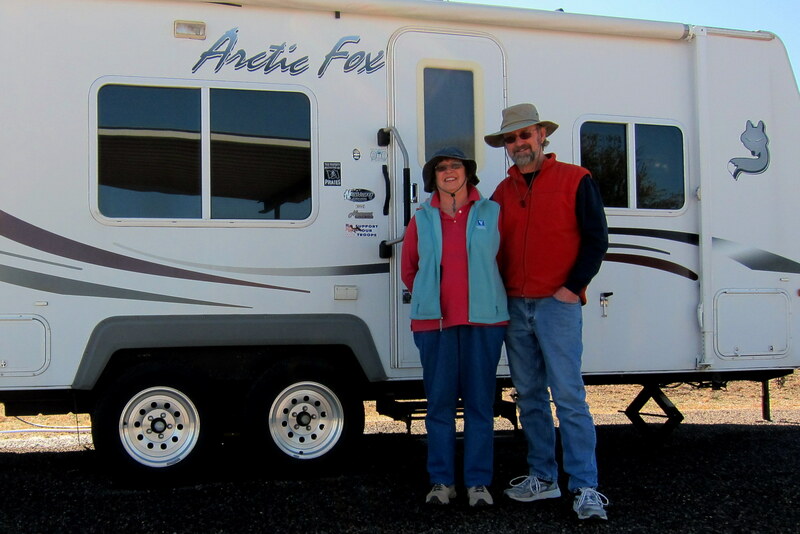 Sometimes the axles need to be aligned, we have had to have it done on both Foxes we have bought ….we had a lot of wear on a couple of tires in only 4,000 miles…had to replace them all, and get the axles taken care of. Can hardly wait for your next trip report! Thanks for the nice comment about the Journal and for the tire tip. We replaced all four last year after 30,000 miles and one tire did show unusual wear. So we had the axle alignment checked and everything was spot on. We did have the new tires balanced, as you know unusual to do on trailer tires, and so far after 12,000 miles wear appears normal. You’ve done it again…..what fantastic pictures! 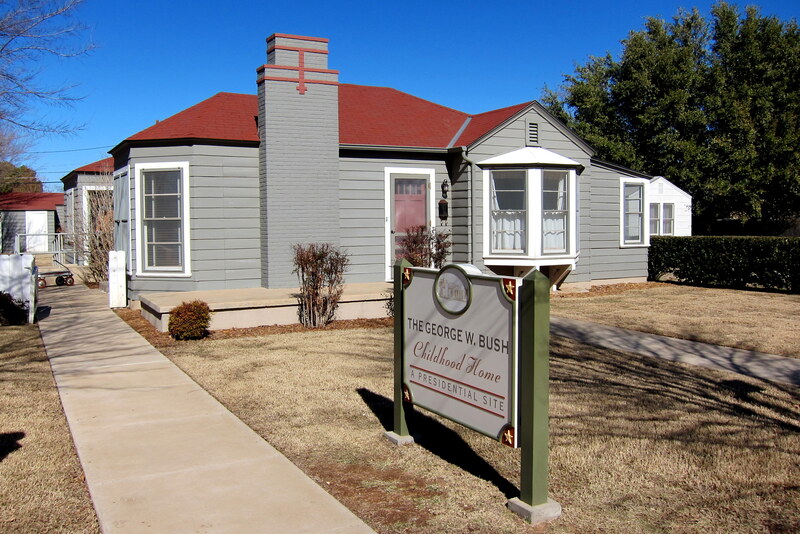 I loved seeing the pictures of Bush’s childhood home. You guys look great too and very happy! Thanks for the comment concerning the photos. Hard to believe they are taken with a compact camera…..modern digital technology is amazing! Don’t be surprised if we end up in the Prescott area…..lot’s of beautiful scenery to photograph and some really nice folks live there as well! Enjoying every minute of “blog-reading”! Some of it is nostalgic and some gives us ideas for new places to go, but ALL of it is entertaining! Enjoy NM (if you haven’t already left it behind) it’s a beautiful state. Hey, great to hear form you guys…..thanks for the nice comment on the Journal. New Mexico is a lot more interesting then we thought, especially the farther north one travels in the state. Hope all is well at your winter home. Hey, great to hear form you…..thanks for the very nice comment on our Journal. We are having a blast on this trip as we have had during the previous Excellent Adventures. I did crash on the bike however not during that video segment. I will tell you that wiping out on a bike trail in the desert hurts a bit more than back home. I heard that the Sebago Ice Fishing Derby had to be cancelled due to the warm temperatures…..really weird winter weather. Looking forward to seeing you guys out at the lake this spring. Hi to Jan and the kids! Paw/Maw print??? I could swear, that the right digit in the left paw print look’s like a Tucker thumb print to me. If you weren’t visiting us right now, I’d bet this was a ruse and you hadn’t even left New Hampshire, or is that Maine. To confirm, look out your front window…..Doobie RV Ranch and Cantina, Site #1! Thanks for the nice comment…..we do cover a lot of ground and end up in some pretty weird places. However, for us, that’s half the fun of it. Take care, looking forward to seeing you all when we return this spring.